I didnt compare side by side because the bad rotors were eaten alive, no thread left almost. These did feel heavier. I bought them on ebay "OEM type"
I sanded the brake pads' thread it was very thick, so i sanded it down 50% and then i was able to slide them on. Thats your answer right there. cast into it somewhere to reference the 'new' rotors thickness to. Im with 157DB on this one; unless you know exactly who you are buying from on Ebay, more often that not that stuff is junk. Ok pad number 2 is pressed all the way in, not even in contact with the rotor upon installation. The problem is, the space between the "WALL" and "pad number 2" is too narrow for the rotor to slide right in between. Does that make sense? I had to grind the pad about 50% to get it wide enough to slide the rotor in between. The rotor is an OEM replacement, so are the pads. WTF is going on here? I have done brakes many times before and never had this problem before. I did push the pistons all the way back in and it wasnt the issue. distance between the "wall" and "pad # 2" is too narrow. Since I have messed with brake systems on a whole lot of cars at my shop, (I have only replaced the rears on mine due to too many dyno pulls), here's what I can lend you. -Make sure the outer pad is seated correctly. Some pads have large springs that need to be positioned in a specific spot. -Since the caliper slides on our cars, place the pads in the bracket and bolt it in. Then position the caliper over it. And while watching the slides clearance (thats those little rubber booty thingy's), the caliper should go in nicely. -Always do one side first before dismantling the other. This way, you have an undisturbed example of how everything goes back together. More than likely Doodad, you will end up re-doing these brake pads soon. Not only because one pad was sanded down half way, but you may end up with pad/rotor issues from uneven wear. Your hand sand job (small lol) may "look" good, but the pad surface is going to be uneven, and it will not bed properly to the rotor. Annoying squeaks may be a problem soon. Last edited by SCCAGT; 11-01-2010 at 09:37 AM. 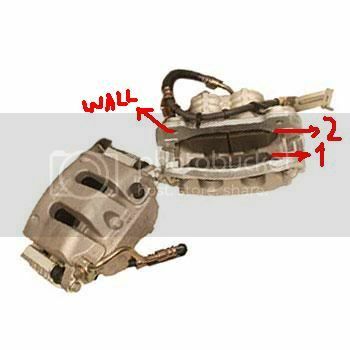 Quick Reply: 2007 Mustang GT brake pads fitment problem. WTF?